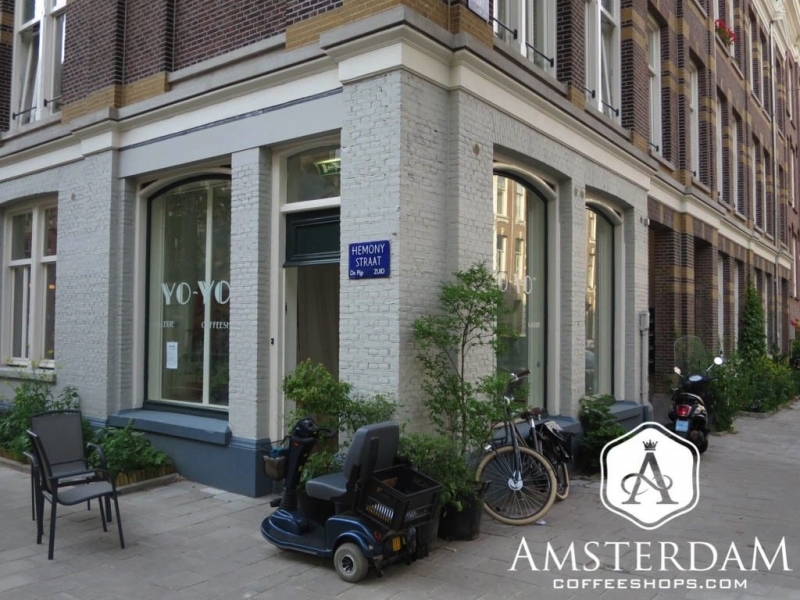 Yo-Yo Coffeeshop is located in the Oude Pijp (Old Pipe) section of Amsterdam South (Zuid). It sits on the eastern edge of this neighborhood, just a block from the Amstel river. 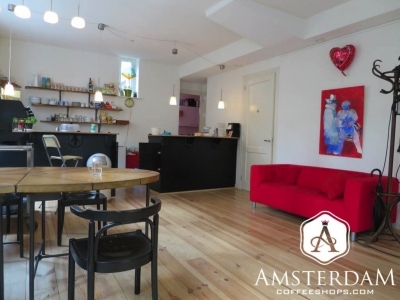 This is a highly desirable residential part of Amsterdam; popular with young professionals. Though the immediate streets here can be a bit quiet, the De Pijp has no shortage of trendy bars, restaurants, cafés, and boutiques. This is an impressive coffeeshop on several levels. First, the shop itself. The décor at Yo-Yo Coffeeshop leans towards contemporary with an open and spacious layout that is awash with natural light. Spotless polished hardwood floors, deep comfortable couches, and beautifully crafted café tables make the shop’s two rooms feel like a perfect city apartment, or small local café. This place is warm and welcoming, at times feeling as cozy as your own living room. Hospitality is usually off the charts, too. Yo-Yo is officially described as a “gallery” (“galerie”) coffeeshop. True to form, it also serves as an art gallery. Beautiful works of art by local artists is on display throughout the shop, and is rotated often. If you like something, be sure to ask about it. They even offer art classes here. To further the “home” feeling of this place, Yo-Yo sometimes also serves hot food. While the selection may not be extensive, they will fix you up with a deliciously satisfying meal. 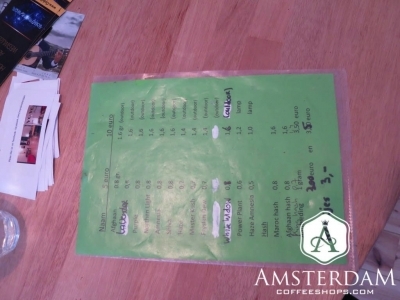 This is a rare feature in the Amsterdam coffeeshop scene. The cannabis menu is robust at Yo-Yo Coffeeshop. The weed-side of the menu typically has a dozen options, give or take. They seem to specialize in outdoor organically grown weed. There are fewer options on the hashish-side, though they still have several types of imported pressed varieties. These are mainly from Morocco and Afghanistan. They also serve great coffee here, as well as tea, and a large selection of sodas and juices. That feeling of home with an ol' school smoke! The shop is located within De Pijb, 5mins walk from Albert Cupyt Markt. This is definitely a locals coffee shop, specialising in mostly outdoor grown weed. The outside is bright and welcoming, a great change from the bright lights and booming tourist driven centre. Inside is open, spacious and lit. The shop is also an art gallery with a nice range of pictures on the walls. We enjoyed relaxing here in the afternoons to sunset. Candles and lamps are also available to set the mood. We loved the "at home" feeling YoYos has, it really was our little go to during our visit. Products sampled: Weed: Northern lights was a relaxing mild old school smoke. We really enjoyed talking for hours with this one. Ammi wasn't great, harsh on the chest and came nothing close to previous ammi's tried at home in the UK and in Dam. Bubblegum also low quality and harsh on the chest. Hash: somango was lovely,spicy and uplifting. Easy on the lungs and tasty on the exhale. Edibles: Cupcakes didn't taste great but packed a punch. It lasted for hours! At €3.50 each they were well worth it. Customer service was quick and okay. Nothing to scream from the roofs about but they were friendly enough. Overall YoYos is a great place to relax and lose track of time in conversation with friends. I'd recommend buying weed elsewhere and bringing it here to enjoy. Try the somango with a lovely hot chocolate.